Dr. Carlozzi is a dedicated dentist who joined our team in July of 2017. He completed his undergraduate studies through Trinity College in Hartford. He went on to earn his doctor of dental medicine degree at the University of Connecticut School of Dental Medicine. He completed the general practice residency at Hartford Hospital. As a dedicated lifelong learner, Dr. Carlozzi regularly learns new skills through continuing education courses. Additionally, he maintains active membership in professional organizations, including the American Dental Association, Connecticut Dental Association, Academy of General Dentistry, and the Hartford Dental Society. 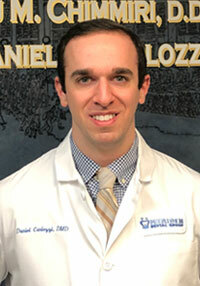 Originally from Waterbury, Connecticut, Dr. Carlozzi enjoys playing piano in his free time.